For many years my philosophy was to put our best staff at your site and personally lead them with my 30 years of experience and a degree in the field. I wanted to make sure the job got done right the first time, every time. 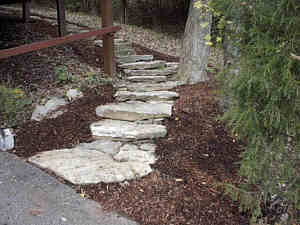 As a result our customer satisfaction rate for landscape service was perhaps one of the highest in the industry. Too often I have encountered clients that have had their dreams turn into nightmares because of companies that chose to send crews with little if any horticultural experience into their customer's yards. I have and always will take a proud stand for American jobs and refuse to hire illegal immigrants. 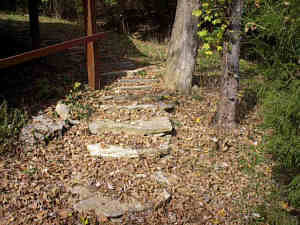 My focus has always been towards maximizing the customer's dollar by utilizing existing materials on site and blending the landscape into the natural surroundings so that by the time one year has passed the landscape looks as though nature herself had put it there. An example of a customer in Montgomery saving thousands in stone cost becasue of abundant natural stone on the rear of the property creatively rearranged by our crew. 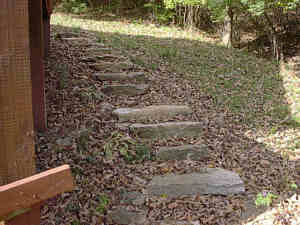 Another example of creative rearrangement of existing stone. 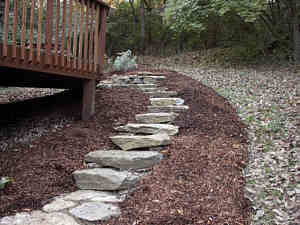 The customer wanted a natural stairway lined by our trademark "easy gardens" leading to her deck & artist's studio on Sheed road. 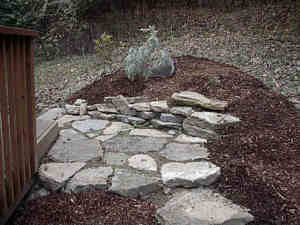 We had set the stone the previous fall and had returned in the spring for the bed installation. We used a large amount of our own recovered potting soil compost to create an optimum rootzone for an easy to work with "play space" for her perennial gardening hobby. Here are 8 average examples from our 2004 summer landscape sessions. Problem - A customer's yew hedge planted in 1962 had grown spindly and ugly and unmanagable. A sound barrier was needed to shield road noise from busy compton road in Colerain township. Solution - A new installation of 28 emerald green arborvitaes planted in a staggered fashion in 2 rows of 14 plants each to provide an appropriate sound barrier year round. Problem - Drainage and privacy issues from adjoining properties were frustrating the homeowners of this beautiful Georgian in Glendale. Solution - A beautiful new dry creek bed that is both functional and aesthetic and a row of emerald green arborvitae for year round privacy. 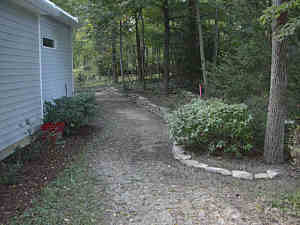 Major street renovations and a new stone planter had left the back and side yard of this home in North Avondale bare. 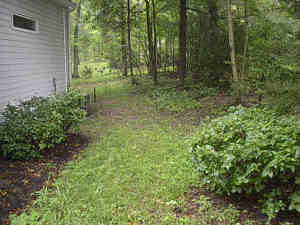 The homeowners wanted unique plantings that would be both aesthetic and functional providing spring color and privacy to the back yard. Solution - Due to the tight space of the planter a Capital flowering pear (8' wide x 32' tall at maturity) was chosen to give height without width, spring flowers and waxy green foliage all summer. The top of the first terrace was planted with Girrard's orange witchhazel which bursts into color in eraly spring with orange flowers, dense leathery foliage during summer for privacy, and an outstanding show of fall color with shades of purple, red, yellow and orange on the same plant! 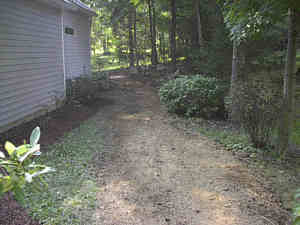 Problem - A bleak and bare front yard was left behind after a large tree had been removed from this home in College hill. Solution - A new raised planter bed with a weeping cherry and perennial underplantings of liatris and candy tuft which will tolerate the hot sun and exposure to Hamilton avenue until the new tree becomes established. Problem - The customer had purchased a lotus plant and the "mammy made" as she put it, plastic laundry buckets were not going to accomodate it. Problem - privacy issues of the rear patio of a residence at a busy intersection of Miami avenue in madeira. 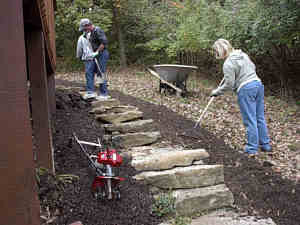 Problem - The new homeowners of this residence in Mack wanted raised beds to begin their new unique plant collection, having left their old one behind in Wisconsin. 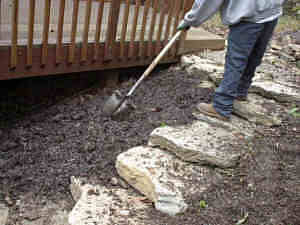 Solution - Remove old brush form around the trees and install new raised beds ready for fall and spring planting.